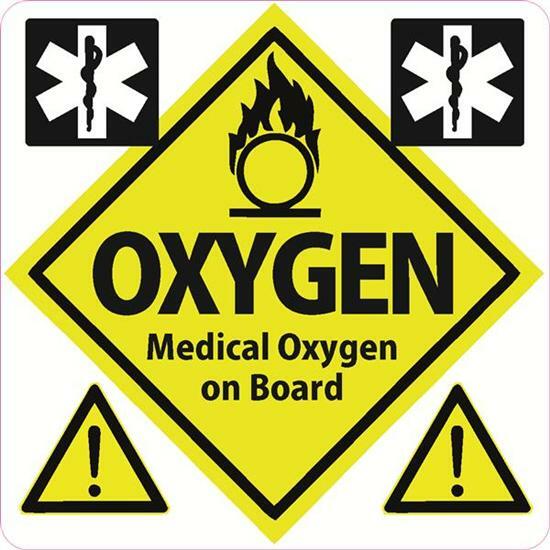 Medical oxygen on board DCS62 Interior Car sticker, designed for a car window. This Oxygen on Board sign sticks to the inside of the car window rather than being applied to the outside. That means the sticker stays in place securely and will always be prominently displayed, alerting everyone who needs to know to the possibility that you have oxygen cylinders on board for medical purposes. This simple, high quality sticker measures 100mm x 100mm (4" x 4"). Purchased for my niece as she had a premature baby coming home from hospital who has to have oxygen at home, she was delighted and just what she needed. Stuck smoothly to inside of window.peace of mind that if I\'m ever in an accident the emergency services will pick up on the o2 promptly. Excellent. Good price. People do take notice of it. Arrived quickly thank you. Could really do with one that is easy to take out of the car when oxygen not on board. Does the job. A clear sign for displaying in the vehicle- not too obtrusive and adheres well to the window. Nice sticker giving a clear message........a smaller size option would have been better for me as my rear window is a little on the small size as it is !!! perfect, as above again thankyou. Very quick and efficient service my first order impressed. the decal is great - however since I have tinted windows I need something that clings to the outside of the car. The decal can hardly be seen -have you anything like that in the same decal? for the emergency services in case of accident. This was ideal for my mother in law who carries the oxygen she needs in her car .She contacted the fire brigade to see if they could give her a sticker to put in her car window they no longer supply them .I went on line and found this site excellent product and service highly recommended. It is a clear, easily useable sign. fast service and delivery. Well done. 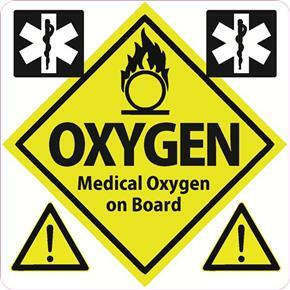 A good sticker and essential if you are carrying oxygen. However it was a bit smaller than I expected. Thank you very much for your speedy response to my order. The stickers were required urgently. If required in the future for any items we need we wont hesitate in contacting you.